I just thought I’d post on a little bit of simple cooking for a change, and something fairly synonymous with Japan – miso shiru. This is one of the recipes I’ve kind of worked along with of late – a carrot and daikon vegetable one. I’m a big fan of soups generally, growing up with Scotch broth and chunky vegetable soups in the UK, so I tend to go a little heavier in this recipe than others. Cooking time: 20-30mins. (to whatever). Makes 4-5 bowls worth. First off, get the water boiling in a decent sized pan. Add the carrots and daikon to this. I tend to leave the vegetables chunky – about 1cm+ on a side – and since carrots and daikon are fairly hard, you want to soften them up a little before adding the rest of the ingredients. This is when I usually add a few drops of Worcester sauce, which some people don’t go for, but I find it a bit more subtle than soy or bare salt, but still adding something to the background flavour. Once the vegetables have softened up a little I take it off the boil, then slowly stir in the miso-dashi paste. I’m lazy – I don’t make my own dashi, and since I’ve seen nice old ladies buying the same stuff I use, it must be legitimate, right? I just don’t have time for boiling up various fish and such. Either way, it tastes pretty good. Now is a good time to add wakame if that’s your thing, and after a few more minutes, add the tofu, once you’ve sliced that to the size you like. I find it prudent not to cut it too small, especially with kinu tofu, so it’s still easy to retrieve from the bowl when you’re eating, and so that it doesn’t fall to pieces if it’s sat cooking for any period of time. Keep it going for a few more minutes, by which time the daikon should be cooked and the tofu will be mixed through and then serve in a small bowl. 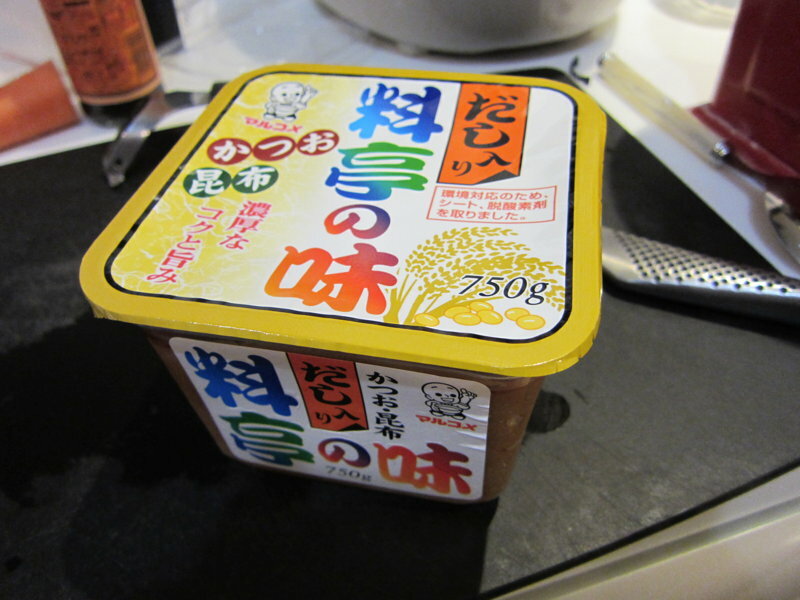 For those not too familiar, you can usually get two main types of tofu in the supermarkets here – kinu （絹）and momen (木綿) – named after how they’re made, being from silk and cotton sieves respectively. The kinu tofus are a bit smoother, but some prefer the more solid momen variety. A couple of friends have commented that I use more miso-dashi than they would, and from having had a lot of miso shiru in various restaurants, that’s probably true, so you might want to reduce the amount of miso. The truth is, I like miso. I like miso ramen. I like miso onigiri. Anyway, I thought I’d throw this simple recipe out there but it’s so simple it seems just too obvious. Any tips or family recipes always appreciated.